Hospital Tent is used for small dispensary to big hospital tent in the field depending on its size. It is completely adaptable to all weather conditions. We can manufacture different models suitable for varying environment. These tents can be custom made as per requirements by changing windows, doors, HVAC provisions, ventilation openings, internal partitions and connectivity with other tents. 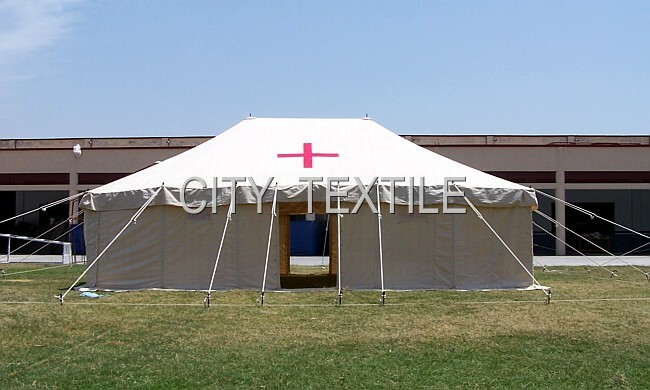 Emergency Relief Hospital Tent Comes in 3 Product Variations or Features that can be Customized as per order. 350 – 650 g/m2 cotton/polyester blend waterproof and rot proof fabric. 350 – 550 g/m2 cotton/polyester blend waterproof and rot proof fabric.